After getting several estimates from book binders and testing several print-on-demand services, I’ve found Selkie’s print version a home on Magcloud. There is a link to the print version on the right sidebar, or just click here directly. Magcloud also offers a free digital version with the print version, along with an iPad option. So Magcloud is also a secondary alternative to getting the Volume 1 ebook, if that’s what you prefer. So, if you’ve been wanting a way to share Selkie with friends offline, or if you’re just a fan of paper media, this is for you! Enjoy, and as always, thanks for reading! My original "punchline" for the bottom row was a silent beat panel followed up with Sandy pictograph-cursing. I love the pictograph-cursing, but it's probably an easy thing to over-rely on. Secondary re-write "punchline" before I settled on the current one was, "Yeah, well YOU wanted to play TAG for the hundredth-billionth-millionth time! At least i went outside the BOX!" This is getting a little sinister. I really want to see Tommy caught and chastised to the point where his parents can’t rationalize it away. Also, FIRST! …well. Aren’t the Trunchbulls raising themselves a darling little sociopath? With all due respect, Tommy / ‘Truck’ is really starting to worry me. He seems like the kind of person someone is going to bite in self-defense when he is a grown-up. lol the chubby one’s face is great. As much as I love Sandy’s retort in the final panel, I feel a bit like an idiot for reading the comic from right-to-left instead of left-to-right. ^^”’ I’ve been reading online manga for a few hours… so… yeah… derp to me. It’s not just you, I used to do that all the time. Now, I think I’ve adapted so that I know which way to read things. Hopefully you will too. Tommy knows of subtlety. Not as dumb as his nickname implies. Fear this one. Smartphones. Hidden mics. Various other consumer-level surveillance equipment and common gadgets that can be used as such. From the caveman days up until the 1990s, that would have been a smart plan. Truck would have got away with it. He would have gone on to be an excellent terrorist until graduating high school, after which he’d either adapt his tactics to things like group hazing and subtler abuse, or he’d choose the wrong target and get beaten into realizing his parents can’t passively support his abusive behavior any longer. But this is the age of kids with smartphones and cheap digital multimedia equipment. If none in the group have it, they just need to make friends with someone who has just one decent smartphone. Truck is full of himself enough to “monologue” himself into trouble on camera if he doesn’t realize he’s being recorded. He would have incriminated himself right then if they had been prepared. This comic is set in 201X-ish, right? No, no, no, you have this all wrong. We use microchips! I’m sure we can get the Trunchbulls to help with that! The comic is loosely set in 2010 with a minor sliding-timeline for pop-culture jokes as I see fit (which basically means I will have George quote the Meet the Medic short without stressing about the fact it came out in 2011, for example). This is because I started the strip in 2010 with an established age of Selkie as 8 and I don’t want a Simpsons set-up where she stays 8 FOREVER even though time is clearly keeping pace with the real world. And I was going to say this before Tarnagh mentioned it, but considering the Orphanage Crew live in a government-run group home, I don’t see them having smartphones. I figure the kids probably eat the discount lunch menu, wear second-hand clothing, and don’t get a whole lot of frills. The obvious exceptions to this would be Selkie and Heather. However, nothing Selkie’s shown suggests to me that she has been given a smartphone. I can, however, see a lot of reasons for Heather, with her well-off parents and their big house in a private community, to have a smartphone. I may explore that idea later. This… this is scaring me. I know it will probably get resolved, but I just don’t like this dynamic. Why are these kids even ganging up on the orphans? Because the orphans tried to even out a snowball fight so it would be more fair and be more fun. Then the other kids also called for reinforcements, and made it into an extremely unbalanced “cream the other side” fest, which was then (in their eyes unfairly) stopped by the teachers. The other kids really aren’t ganging up on the orphans; they’re ganging up on a group of kids who have a relationship because they are all from the same orphanage. The other kids are basically just continuing the snowball fight because the orphans had the gall to alert the teachers and get the other kids in some trouble. 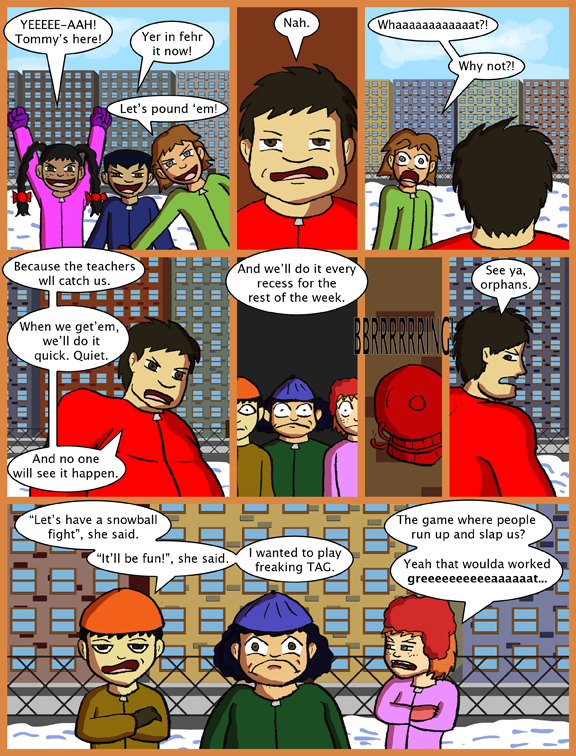 The orphans-versus-other kids conflict is separate from but connected to the whole “Truck is a jerk” issue, and I really don’t like where this is going. Think about it: the other kids are just as bad as Truck if they’re going to fight some kids for getting them caught acting. You know what my advice would be? Orphans, stay inside at recess. I know it’s a huge sacrifice, but until this cools down, you’re far better off staying where all the teachers can see you. In most schools you don’t have an option of skipping recess and staying inside. The children could try to stay near whichever teacher is monitoring the recess but even then staying in his/her sight the entire time could be difficult. When I was a substitute teacher it always amazed me how few adults were on the playground and how many areas were out of sight. It was rare that there was any one place I could stand and see the entire playground so I usually moved around to keep an eye on everyone and things can happen really quickly when the teacher’s back is turned. You sure got that right. I remember a number of times, drying blood on a cut and patched up lip, fresh shiner under an eye, bruised jaw. Try to get help from a teacher and get told I need to stop snitching, and every time I tried to stay inside during recess, I’d get physically pushed out because I just had to get physical exercise the teachers would say. The schoolyard is a rough jungle. In elementary school? Someone, probably several someones should haqve been fired. In elementary school, the adults believe that you know nothing of what’s best for you or how to be safe if they haven’t taught it to you themselves. They also firmly believe that A) if they didn’t see it, it didn’t happen, B) if they didn’t see it, but there’s other proof that it happened, it couldn’t possibly be important enough to bother them with, otherwise they surely would have seen it, and C) as a result, they know everything worth knowing about what goes on anywhere they happen to be, and any child who claims otherwise doesn’t know what they’re talking about, or is just plain talking back (read: saying things that aren’t convenient for an adult to hear). They also tend to think children are innocent and kind at heart, unless the child in question has established a reputation as what they term a ‘troublemaker’ (read: Any child that doesn’t behave in a manner that’s convenient for them). Typical schoolyard behavior, Mort. In their eyes, the orphans had no right to even up the fight, as the objective was, as you said, to cream the other side, not to be fair. Going to the teachers also generally makes things worse, as now they’ve gotten the other kids in trouble on top of denying them the ‘right’ to win a lopsided fight. Sorry. I’m not all that aware of what is or what is not typical schoolyard behavior as I have been homeschooled all my life. And I guess I must amend my statement to: Geez. I am so glad that I am homeschooled that I never interacted with this. Internal grammar police: SO I never interacted with this. Sorry, couldn’t help myself. As to being homeschooled, you have no idea how lucky you were. Thank you David….I love the pictures of us. I noticed in the previous comic that Truck was present but not physically participating, so I’m not surprised at today’s outcome. My hunch is that as a condition of getting unsuspended, he’s been told that he’d damned well better not be seen within a mile of a fight any time soon. Hoo boy … the only thing worse than a bully is a bully with brains. If I were one of the orphans, I’d be trying to get into the Witness Protection Program right about now. I’m very glad Selkie is out of this, at least for now. Question that may have been answered already, but can Todd’s parents not conceive? Perhaps, but maybe they’re the type of people that felt like there was enough homeless children and they could contribute to bringing some into a stable home with loving parents. Perhaps they couldn’t conceive, one or the other or both. It could be any reason, but what’s important is they were great parents that did provide a loving home to children who needed them. And I approve of such good (grand)parents. Was wondering if that’s why thu adopted so many children. Most people I know who have adopted have their own biological children as well as adopted ones or they are unable to have their own so they adopted. Another common one is the parents were adopted themselves or at least one parent was and so they chose to adopt. I was curious if Todd’s parents had a specific meaning behind it was all. I’ve not readily met someone who has adopted so many children without also having at least pne biological child themselves so I assumed there was some sort of reason for it. I saw this coming. Not the part about Tommy getting suspended, but the continuation of the wrong lesson being learned. Isn’t that what school’s meant to teach you? No? Have I got the wrong message? Bother. I was hoping it would be longer before a Veggietales quote was a perfect fit. I have a feeling Gendo Trunchbull is teaching his son to be a hitman. This… is the kind of stuff where the inner bullied psychopath wants to come out and make them pay. Having read the three newest comics I totally understand the WHY of Truck acting out, and the rational part of me knows lashing out at the bully wouldn’t help, but the once bullied kin inside me wants to wreck him, whether emotionally or physically or both. I truly do try and control that instinct, though. I just have no tolerance for bullies and end up bringing myself to their level and worse because of it. It goes to show a perfect example of the role “Nurture” plays on one’s personality. At this point I think about the only way to properly discipline Tommy would be to flog him. And his parents.